For three weeks in January, students from MIT’s Global Entrepreneurship Lab (G-LAB) programme flew into the Kingdom to work with Kamworks to assess how new solar technologies and business models can be applied in Cambodia. In this project, the technology that the students from MIT focused on is what is known as the “Pay-Go” model. Under this system, a GSM chip is fitted into the respective solar panels that are sold by Kamworks which allows Kamworks to remotely monitor the status of their products. Elaborating on the features of the chip, Beltes said, “It allows us to see how our systems are performing. We can see how much energy our customers are using, we can see how full the battery is and how much the system is charging everyday. This allows us to automatically see if there are any problems with the system and we can send a technician before the customer needs to call us”. Yet another benefit of the chip is its ability to allow customers to by-pass the upfront cost of buying a solar panel as the monitoring capabilities of the system allows for an installment based payment plan. 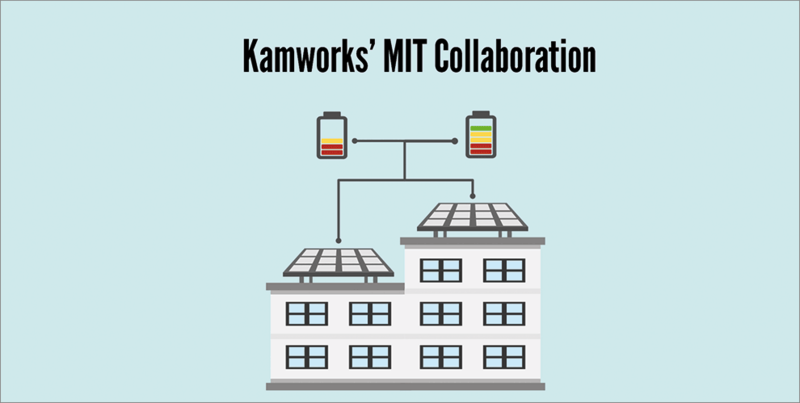 This social impact was a major reason why the MIT students chose to work on the Kamworks project. To find out more about their work in their month here and why they chose Cambodia, Geeks in Cambodia sat down with Angela Rios (AR) and Deborah Olsson (DO), two team members from the MIT team here in Cambodia. The following interview has been edited for clarity, language and flow. Could you give us a little insight into your preparation for the time in Cambodia? DO: We’ve been working with Kamworks for an entire semester from August to December before coming on site so in terms of school, we took classes on project management, safety, dealing with clients in different cultures and other related topics. We also had weekly Skype sessions with Kamworks so I see our time here as being a continuation of the work that has been done through the semester. We’re here basically to finalise and present our research to Kamworks with our recommendations. Can you give us a little preview into your project? DO: Well, Kamworks developed this Pay-Go technology in-house (pay go meaning pay as you go) and it’s the reason they are able to reach so many off-the-grid communities. This technology provides this financing mechanism through a GSM chip that Kamworks’ puts in their solar home system which enables them to by-pass the huge upfront cost of the hardware. AR: Yeap and even though the energy at the end of the process is cheaper, the up-front costs are really high and this solution has allowed Kamworks to provide those in rural areas with the energy they need. DO: So for our project, what we were looking to do is to figure out how we can use this Pay-Go technology not only in solar home systems but in other products, other markets and other locations. Our role was to do a lot of market research, market sizing, financial modeling, while trying to determine the market opportunities for Kamworks. Why did you choose to work in Cambodia for your month abroad? AR: I think we first looked at the project and the company in the country. Kamworks has been actively involved in innovation and is probably one of the most innovative companies in the country. This was the first thing that we saw in them – the innovation within the company. In addition, all of the projects that we had options to go to were in developing countries and this was the only project in Cambodia so because we were looking at something that was a little bit different and we wanted to reach out to a country that was otherwise hard to reach out to, we chose to work here. After your research, how do you see Pay-Go affecting the tech scene here in Cambodia? DO: I think the biggest aspect of this technology is financial inclusion. Just like it allows Kamworks to reach consumer segments that would otherwise be unreachable, you would be able to use this technology to cater to those who need a big up front investment but they can’t afford it when the sum is that large at one go. With Pay-Go, they would now be able to acquire this technology because it reduces the risk taken upon by the company giving them the technology they want. In terms of the tech, entrepreneurial and innovation scene as a whole, how do you see that developing? AR: In general, I think Cambodia has very good potential to become a player in other segments, not just the solar segment because this kind of innovative technology could be applied to other projects. So for sure, we do see the potential for the market to expand and we see as well that the technology is unique. Furthermore, I think simply because each of these companies are based in Cambodia, they will have the capacity to provide consumer information and better solutions tailored to the needs of the country. When I look at how Cambodia is developing as well, I think that the technologies here are being developed more in a web and can have multiple uses, rather than in a straight line. What would be your advice to those who are looking to enter the tech/startup scene? AR: For people that want to start a business or a startup, I think many have this impression that they need to have this great idea. But what I’ve seen is that its not necessarily that, but it always starts with what people are doing, what people need, what is happening on the ground and what are the problems you can tackle. I’ve seen that it usually starts with finding the problem instead of the solution first, then you’d develop a solution to address that problem. DO: My advice would be that it’s really all about perseverance and commitment. I mean you can look at Kamworks and realise they have been here for 10 years and they’ve always been trying different things to improve their system. The students were here under the MIT G-Lab programme which is in its 17th year. Under the programme, MIT students have worked with over 375 startups and growing companies in more than 50 emerging and frontier markets worldwide. Stay locked to Geeks in Cambodia for updates on the Kingdom’s most exciting tech, startup and entrepreneurial happenings. (English) Third Edition Of SmartStart Open For Applications!